Signal conditioning module biedt two instrumentation amplifiers ideal for low-level signals zoals bridge circuits (eg strain gauges) and thermocouples. 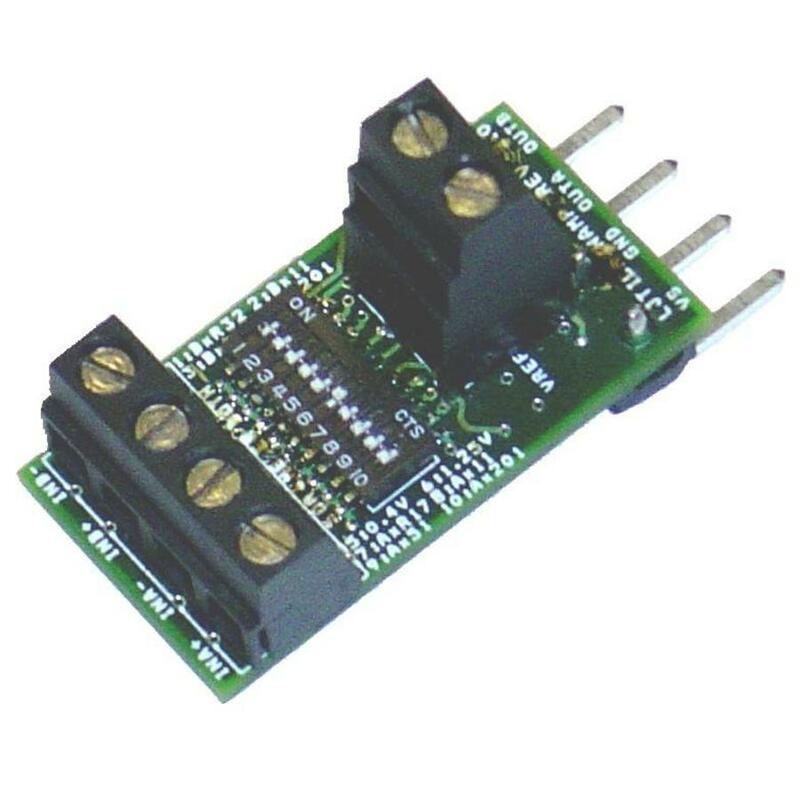 The LJTick-InAmp (LJTIA) is a signal conditioning module That biedt two instrumentation amplifiers ideal for low-level signals zoals bridge circuits (strain gauges) and thermocouples. The LJTIA has 5 gain settings per channel and two selectable output voltage offsets (VOffset). The 4-pin design plugs into the standard AIN / AIN / GND / VS screw terminal block found on newer LabJacks zoals the U3 and UE9. The pictures below show the LJTIA plugged into the U3 on the left and plugged into the UE9 on the right. The block of four screw terminals at the left edge of the LJTIA (Figure 1 above) Provides a positive and negative differential input for each channel. Towards the Labjack side of the LJTIA has a pair of screw terminals That providence a ground connection (GND) and a +2.50 volt reference (VREF). The reference is capable of sourcing enough current (see Specifications) to function as the excitation voltage for mostcommon bridge circuits. 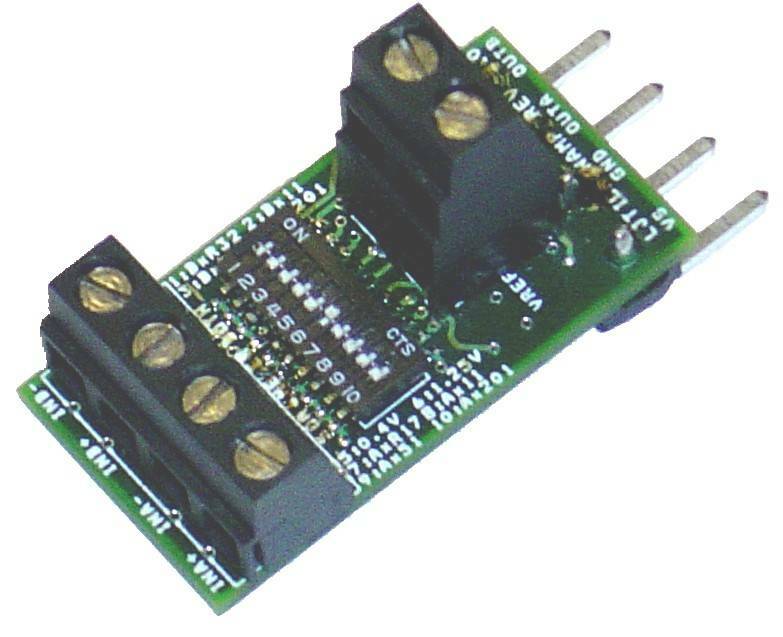 In between the blocks of screw-terminal is a 10-position DIP switch used to Specify gain and offset. Each channel Has A switch (numbers 1 & 7) That HAS BEEN left without factory-installed gain resistors. Resistors can be installed by the end-user to custom providence gains accordion thing to G = 1 + (100k / R). For example, a resistance of 100 ohms would providence the maximum allowable gain or 1001. Also, multiple switches can be closed at the same time to get a few other gains (x61, x211, x251, and x261) as the gain settings resistors (10k, 2k, and 500) wind up in parallel. Extending from the back of the LJTick-InAmp are four pins. The first two pins providence +5 volt power and ground from the Labjack. The other two pins are the instrumentation amplifier outputs and connect to analog inputs on the Labjack. The four-pin plug directly into the 5.0 mm spaced screw terminals on the Labjack U3 UE9, or other future devices as shown in Figure 4. Each channel on the LJTIA HAS an AD623 instrumentation amplifier (in-amp) from Analog Devices. The allowable signal range (Vin) is Determined by a combination of Gain, VOffset, Vcm, and Vout. See the Signal Range Tables in Appendix A.
VOffset: This is an offset voltage added to the in-amp output. If DIP switch # 5 is on, the offset is +0.4 volts, and if DIP switch # 6 is on, the offset is +1.25 volts. The same offset Applies to both channels of the LJTick-InAmp. One offset must always be selected (0 volts is not an option), but both offsets shouldering never be enabled at the same time. The +0.4 volt offset is gene rally used with signals That Are mostly unipolar, while the offset is +1.25 volt gene rally used with bipolar signals. VCM: This is the common mode voltage of the differential inputs. For an in-amp, that is defined as the average of the common mode voltage of each input. For instance, if the negative input is grounded, and single-ended signal is connected to the positive input, Vcm is equal to Vin / 2. Another common situation is When using a Wheatstone bridge where VREF = 2.5 is providing the excitation. In this case, each input is at about 1:25 volts Compared to ground, and osmanthus Vcm is about 1:25 volts. Vin: This is the voltage difference between IN + and IN-. In the Following Signal Range Tables, the "Low" column is the minimum Vin where Vout is 10 mV or higher, the "High 2.5V" column is the maximum Vin Vout where over 2.5 volts or less, and the "High 4.5V" column is the maximum Vin where Vout is 4.5 volts or less. Vout: This is the single-ended (reffered to ground) voltage output from the in-amp. Because of the power supply to the in-amp, the full output swing is about 0:01 to volts: 4.5 volts. The "Low" and "High" columns in the Signal Range Tables give the output at the respective Vin.